A report from Italy on the Samsung Galaxy S10 prices confirms the British prices we saw over a month ago. Long story short, you can spend €780 for the base model or twice as much for the fully-loaded model (with 4G connectivity, the 5G phones will likely cost even more). Note that the RAM and storage capacity are tied – that is if you want more storage, you have to get more RAM too. That makes the jump between memory tiers a salty €250. Good thing that Samsung will preserve the microSD slot. Anyway, these are essentially identical to the British prices with some fluctuation in the euro/pound exchange rate. Costs in mainland Europe should be similar, though sometimes things get pricier in Germany and France – and especially in Scandinavia. Here’s a list of expected color options. 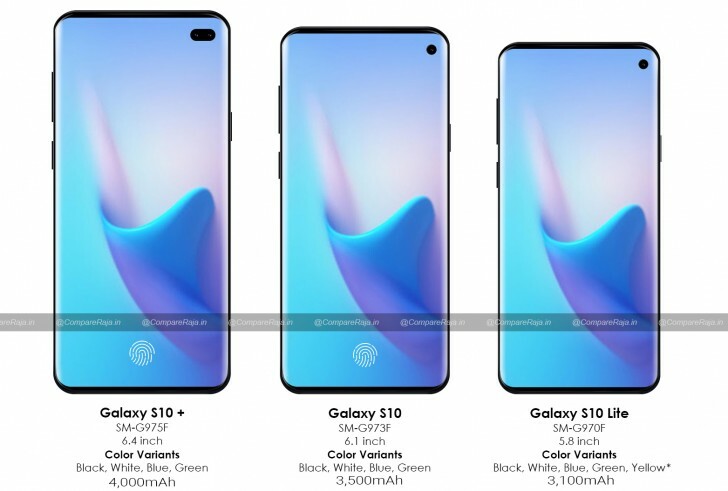 It seems that Green will join Black and White as a standard color, then the Galaxy S10 Lite and Galaxy S10+ will have extra versions – a youthful yellow for the Lite and two non-ceramic special versions for the S10+. The Samsung Galaxy S10 trio will be unveiled on February 20 and should be in stores on March 8.